The remains of the motte are on private land although can be seen from an adjacent public right of way. The moated site can be seen from the main road although care must be taken due to fast moving traffic. Notes: Aldingham is found on the A5087 Coast Road that runs between Ulverston and Barrow. Following signs for the "Scenic Route" to Barrow. The castle itself is not sign-posted but is accessed via a footpath next to a lay-by. Aldingham Castle. Coastal erosion means the castle now stands perioulously upon the cliff edge. The outline of the bailey, to the right of the motte, can be seen from this photograph. The moated site is visible in the top right hand corner. Aldingham Castle was originally built in the late eleventh or early twelfth century as a ringwork fortification by Roger the Poitevin. When he rebelled against Henry I it passed to the Fleming family who upgraded the site into a motte-and-bailey. It was occupied for around 200 years before being replaced by a moated manor house and later by Gleaston Castle. According to the Domesday Book (1086), prior to the Norman Conquest the Manor of Aldingham had been owned by Ernulf whose estates were centred on Amounderness (central Lancashire) but who also owned land in southern Cumbria, Lancashire and Yorkshire. According to the survey his estates had been taken over by the Crown but no mention is made of the castle. 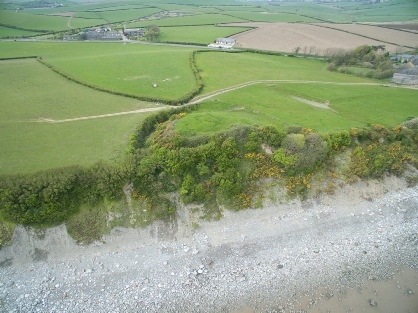 Whilst fortifications weren't always listed in the Domesday Book, it is probable the structure dates from after the survey but before 1102 when the site was owned by Roger the Poitevin. He had been granted extensive estates in Lancashire and, due to existing trade and lines of communication across Morecambe Bay, he also received lands in Furness. It was probably he who built the first castle at Aldingham in the form of an earth and timber ringwork fortification. Roger lost his English lands in 1102 when he rebelled hoping to depose Henry I of England in favour of Robert Curthose, Duke of Normandy. The revolt failed and the next reference we have to Aldingham is in 1127 when it was in the hands of Michael le Fleming, Lord of Aldingham. He converted the earlier ringwork into a motte-and-bailey although the defences remained in timber. Situated on top of a cliff overlooking Morecambe Bay, it occupied a commanding position and its tower would have been visible for miles around. The bailey was sighted to the north and north-east of the motte and was protected by a ditch (part of which still survives). A rectangular moated site, known as Aldingham Grange, is found around 100 metres to the west of the castle and is believed to be from a thirteenth century fortified manor house built by the le Flemings as a replacement for the castle. 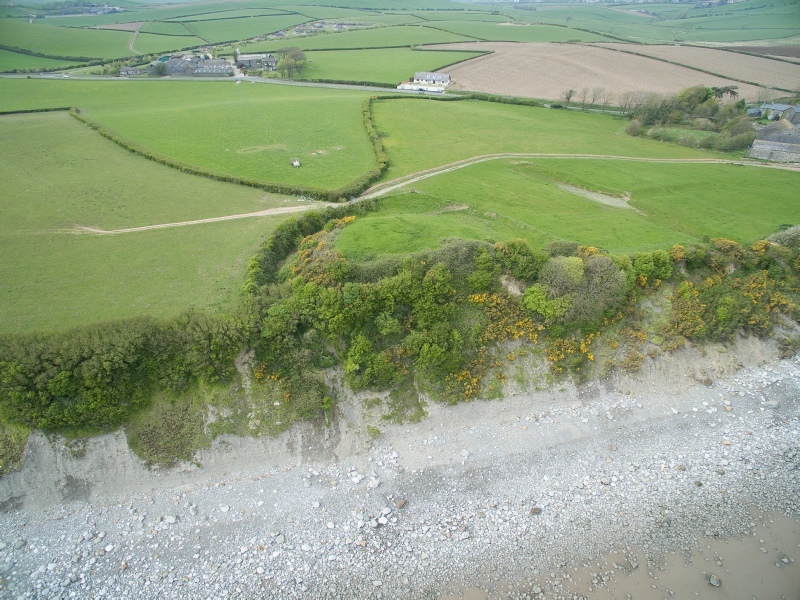 Precisely why this new site was built is uncertain but it could reflect issues of coastal erosion with the motte. Certainly archaeological evidence suggests the motte was shored up with timber revetting but this work was never completed implying the decision was made to shift to the new site. It is possible Aldingham Grange already existed in one form or another - perhaps a water feature such as a fishpond or alternatively a livestock enclosure - so may have been a relatively inexpensive modification. 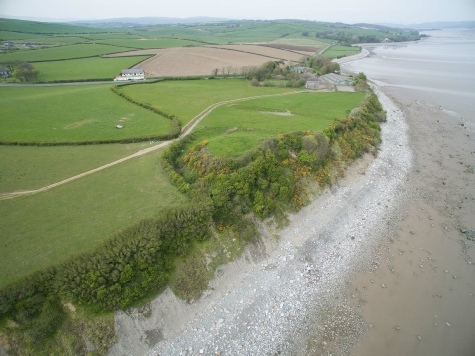 Regardless of whether the castle was replaced or simply augmented by whatever structure was built upon Aldingham Grange, the Lords of Aldingham abandoned the site completely in the fourteenth century when they moved their residence inshore to Gleaston Castle. This probably occurred around 1340 when Edward III granted Robert de Harrington, who had acquired the Lordship through marriage with the le Fleming family, a licence to enclosure a park there. Today only earthworks remain of both the motte and the moated site.